Every year Santa Claus grants a single interview with a representative of the popular media. This representative gathers questions from all major media sources and presents them to Santa at one time. Ted Koppel had practically begged to get Santa on Nightline this year but Santa doesn’t usually stay up that late and had to decline. Instead, he met with Molly Kingston of the Apple Valley Advocate in Burnham, Arkansas, giving the cub reporter her first worldwide exclusive. Q: Thank you, Mr. Claus for this opportunity to meet with you. A: Please, Molly. We have known each other for a long time. Call me Santa. Q: I’m sorry. I have never had a world exclusive with a major celebrity before, Santa. I want to be as objective and professional as possible. My readers need to be able to see that I have been fair and balanced in my questions. A: Okay. But I know everyone who does an interview with me. It is hard to sit here and not be completely familiar with you. You used to write me the nicest letters. Your belief in Santa Claus is nothing to be ashamed of. Q: Oh, Santa. I’m not ashamed. I just don’t want to blow this, you know? This is my big break. A: I totally understand, Molly. How’s your mother? Q: She’s fine, thank you for asking. A: Did she get over that nasty flu bug she had? Q: How did you know about that? A: Hey, I’m Santa. I know lots of things. Q: Yes, that was one of the things I wanted to ask you about. Q: Well, like knowing about my mother’s illness. How do you know that? They say that you can see kids when they are sleeping and that you know when they are awake. Some people think that is kind of creepy. A: This is an old question, Molly. One I think we have covered before in a previous interview. Q: Yes, I know your answer about that. But some of my colleagues want to follow-up on this – you know, get down to the heart of it. Are you some kind of spy? A: Ah, you’ve been talking to Dan Rather, haven’t you? Q: See? There you go again. How did you know that question came from Mr. Rather? A: I didn’t really know. It was just a hunch. Dan is a predictable boy. Go ahead, ask me a couple of questions and I can tell you who they came from. Q: Okay, who asked: Who is the sexiest man alive? Q: Correct. Who asked: Did you know about the damage to my satellite dish last Christmas and, if so, when did you know it? Q: Wow. Ok, who asked: Will Santa vote from his Florida vacation home or from his cabin in Vermont? Q: Did someone fax you this list already? Q: Who asked: If I open Santa’s sack on December 26th, what will I find? 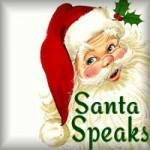 Q: Who asked: If you found out that Mrs. Claus was leading a double-life, what would you do? Q: That’s a good guess but he didn’t really ask that. A: No, but he wants to. Jerry probably asked what he can do to get back on the ‘nice’ list. Q: Jerry Springer is on the naughty list? A: You’d have to ask his mother for sure, I’m just guessing here. Q: How do you know so much about people Santa? A: It isn’t that I know a lot about people. I just have known most people since they were kids. And people do not change a whole lot. Those weren’t really the questions the media wants me to answer, I hope. Please tell me they have a better use of our time. Q: Well, I admit I have done some heavy editing of some of these questions, Santa. A: Good for you, Molly. You’re going to do well in your career. Q: Thank you. You have always said such nice things to me. I appreciate it. Q: I think most of the world wants to know and understand the real Santa Claus. Is there something you’d like to say before we begin? A: Well, I admit that I use these interviews each year to send a little message. But I don’t write books or have a publicist or make movies. I’m not a crusader. I am hoping the world gets the message of Christmas by enjoying what I do each season and somehow will find a way to spread a little Christmas amongst themselves in the same ways. Q: Are you religious, Santa? A: That is an intensely personal question. But one that is vital and one I think I need to answer. And yes, I am very religious. A: Well, that’s not something I will answer because that doesn’t really matter. I believe people of all faiths can celebrate the season together without regard to their religious persuasion. Q: But isn’t Christmas a predominantly Christian observance? A: Well, yes and no. It was much more predominantly Christian 50 years ago than it is today. And, of course, anciently the winter festival we now call Christmas had nothing to do with Christ or religion. Christmas isn’t a day, it is a season – a season of goodwill, of proclaiming peace on earth and, for many like myself, it is a private religious observance. But it can be those things without actually being a religious observance. Peace and goodwill are words that are pretty much universal in their appreciation. Q: So you’re not identifying Christmas anymore as the observance of the birth of Jesus Christ? A: Of course I am. Angels came down to earth and proclaimed His coming. I like to believe I am merely one of the choir, singing the same message in that regard. I love the Christmas story. I cherish the lessons of the life of the Savior. But this is a big world full of many people who do not know, believe or understand Christmas to be about Jesus. To some, they carry on the traditions of their fathers and celebrate the winter festival in the spirit of thanksgiving and hope for the New Year. To others it is a celebration of family. Others look at it as a season to promote peace. I find all that a positive, worthy kind of celebration that doesn’t counter the Christian observance of the day. It too bears a message of goodwill and peace and I support all their efforts. But for me, and my house, it is a religious observance and forever will be. Q: Are you a religious figure? A: What do you mean, like the Pope? Q: Yes, do you have an ecclesiastical calling? A: Well, in the sense that I have people who listen to me preach, no. I have my beliefs. I share them with like-minded people. But I am just a man, that’s all. I believe in Christ. I believe my message of the season crosses religious barriers. I only want to be a doer of good, an example of what is possible. Q: Are you in fact the famed Saint Nicholas, Bishop of Myra of ancient times? A: Well, I’m not that old. A saint is someone is who dead and clearly, I’m not dead. 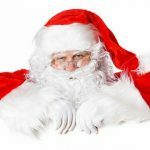 Q: What is the exact correlation then between St. Nicholas and Santa Claus? A: Well, we’re a tradition, mainly. St. Nicholas was a gift giver by nature, it was just his disposition. He had a grand and heralded reputation for freely giving, and not just at Christmas. Many credited him with miracles. He was a man to be admired, and one to emulate. To many, celebrating Christmas would not be the same without him. If there are those in the world who think I am St. Nicholas, I am humbled and honored and will try to do all I can to not besmirch his good name. Q: But you are not one and the same man? A: That would make me nearly 2000 years old. A: As old as my tongue and a little bit older than my teeth. Q: You always say that. Really, how old are you? A: I haven’t the foggiest idea. You’ll have to cut me open and count my rings. A: No, I was kidding. Please don’t cut me open and count my rings. Q: No, I mean about not knowing how old you are. A: Yes, I have no idea. I’m not even sure what day is my birthday. A: Well, when you get old like me you forget little details. Q: So, who are you –really? How did you become Santa? A: Well, now you’re treading on sacred ground. I can’t answer that question for you Molly. A: Because it is not wise. There are just things I choose to keep private because it wouldn’t do the world any good to know. It should be enough for the world to know that I exist. Q: But that’s the very question, Santa. If the world knows your real identity then there wouldn’t be any question or doubt. A: Oh, I think it is just the opposite. If you were to look at my driver’s license, the world would do all manner of unspeakable things to me. They’d run my credit report, look at my charge cards, see my driving record, how I did in school, perhaps peek on where and how I voted and they would be a terrible disruption to my family life. Is it so important that they know who I am so that they can do that? Or is it better for them to hang their stockings in hope that someone so anonymous can drop in late on Christmas Eve and bring a little Christmas cheer? Who I am is not important. What I am, what I represent, the message I bring – those are all things that matter. I think that if there were more anonymous giving in this world it would be a better place. The name of Santa Claus is known for giving without requirement, for giving anonymously, for simply spreading goodwill for the sake of goodwill alone. 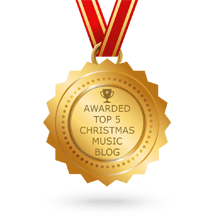 Santa doesn’t do these things to get recognition or praise. The world doesn’t need another monument nor does it need another hero to worship. The season is bigger than me. The world just needs good service, a quality example of giving and a cheerful advocate of a season of joy. Santa has always been all that. I intend to keep it that way. Q: So, Santa Claus is not your real name? A: No, Santa Claus is a title. Q: No, really. What is it? A: That is my real name. Q: I could look it up. A: Go ahead. You won’t find anything. I was born to be nobody. Q: But you’re everything to some. For one great night of the year, you are the man! A: Oh no I’m not. I am just one of the many elements of a season of joy and thanksgiving. The family together is more important than me. The babe in a manger is far more important than me. The expression of peace on earth and goodwill towards men is much more important than me. Q: Santa, this conversation isn’t going very well. I don’t think people will run this interview in their newspapers or on their radio or television shows. A: Why do you feel that way? Q: Because you’re not telling me about the real Santa Claus. I don’t know any more about you than when we began. In fact, even less. You are such a mystery. A: How can you say that, Molly? Did you enjoy your Christmas when you were six years old? A: Do you remember what I brought you? Q: No. But I remember what a great Christmas it was. A: Good. So what does it matter then about me? Q: Because you are the source of great controversy in the world. Many profess belief in you while others say you are actually bad for kids. My job is to explain the gulf between those two. A: Is that really your job, Molly? A: Well, I’m no journalism professional but it seems to me that your job is to just get the facts and then let the world decide for themselves. Q: And that’s what I am saying, Santa. You’re not telling me anything. A: On the contrary, I’ve told you more than I have told anyone else, ever. I told you that I am real. I told you that I am not the St. Nicholas of old. I told you that I am not a religious figure. And I told you that in the grand scheme of things I am merely an element of something much greater. I even told you my real name. And I only did that because you were being a real reporter. What else would you like to know? Q: I’d like to know how to get Santa more respect in the world. A: You and me both, kid. Q: Do you get discouraged? There is hardly peace and goodwill on this earth, Santa. Is your message getting through? A: It would be easy to say it is not, especially if you watch the news or read the papers. But all is not as it seems in the media. I get hope from those who do believe. I avoid discouragement by taking notice of the good things that happen outside the eye of the media – the things that never get reported. Things of good report rarely get press, Molly. Let that be my lesson to you today on journalism. I do only one interview a year because, sadly, the media only wants to talk to me once a year. I’d talk to them everyday if there was something good in it. But they are not looking for good. They are looking for the sensational and the outlandish. In some cases, if they can’t find outlandish they make it up. Q: Are you saying the media is dishonest? A: Sure, some times they are. Not always. Sometimes there is bad news and when there is, they usually get it right. But if there is good news to report, it mostly gets downplayed. You know it. I know it. Why not say it? Q: I know a great many professionals who would disagree with that assessment. Mr. Rather and Mr. Cronkite are not going to like this interview at all. A: That’s because I have not really said anything provocative. To many, news is only news when it is dramatic, when it evokes extreme emotion. That is what sells newspapers and gets people to tune in. Follow the money, Molly, and usually you find out why things work they way they do. Q: Isn’t there anything the world can learn new about you that they don’t already know? A: I have a secret addiction. A: Yes, it is time to finally discuss it. I want to get it out. Q: By all means. What is it? Q: It’s okay, Santa. The world wants to see your more human side. A: Well, ok, I’ll just blurt it out then. A: I’m addicted to… I mean I like to…wear men’s underwear. There, I said it. Q: [laughs] Santa, you’re too funny. A: Well, what’s to say? I’m a boring guy. I don’t have any skeletons in my closet, I lead a quiet life, I avoid extreme positions, I generally refuse to discuss politics and religion. There’s really no big news with me except for the most important message of all. A: Yes, Merry Christmas. That’s the message. Q: Well, yes, Santa. Everyone knows that. A: But what does that really mean? Q: Mean? It means, you know, Merry Christmas. Happy holidays. I guess. A: Molly, I’m surprised at you. Merry Christmas is much more than just a greeting. A: No, I’m serious about this. There is a huge message packed inside those two words. That is why I keep coming back year after year. I want folks to get that message. Just two words. That’s all I want them to understand. But for most it takes a lifetime just to get it. Q: Santa, what’s the big message? I had no idea. I thought Merry Christmas simply meant Merry Christmas. A: Molly, when someone looks you square in the eye and warmly says “Merry Christmas”, how does that make you feel? Q: [smiles] It makes me feel good. Q: Because I love Christmas. A: And why do you love Christmas? A: Sure it’s fun. But pinball is fun. Do you get the same feeling from pinball as you do from Christmas? Q: No, no. Christmas is much more fun. I love Christmas for so many reasons. A: Really? Name some reasons for me. Q: Well, it is not just one or two things. I love Christmas because it is a time where I am together with the people I love the most, we do fun things together, we have a great time. I love Christmas for all of it. I love Christmas because it has so many emotions tied to it. The best memories are made at Christmas. A: Yes, that’s exactly right. But it is much more than even all that. Q: Say, who’s interviewing whom here? A: That’s ok, Molly. This is the best interviewed I have had since Charles Dickens. A: Yep, sure did. Who do you think was the model for Christmas-yet-to-come? A: Yep. See, another world exclusive detail for you. Q: Thanks, Santa. But what can be much more about Christmas than I just described? A: Well, Molly. It’s love. All of that is the byproduct of pure love – peace on earth, goodwill to all men. That’s the message. Those are the glad tidings. Q: Don’t you think we know that? A: I’m not so sure. Do you think there is peace on earth? Q: No, of course not. A: Is there goodwill towards men – really? A: And as long as that answer is no then I think folks are not hearing the message of Christmas. Q: If they are not getting it, Santa, why not just tell them. Q: [sighs] Nobody is going to see, hear or read this interview, Santa. A: Maybe not. Or maybe they will. You never know. Just when I think I have people figured out and lower my expectations someone comes along and surprises me. I have learned to never underestimate the ability in all people to do good. Q: Well, that’s hopeful, at least. A: I am an optimist, Molly. The world might not get the message of Christmas entirely, but that doesn’t mean I think the world is a bad place or that they will never get it. Q: What do you think of the world then? If you weren’t Santa, what would you be? A: Oh, no doubt about that. I’d be a school teacher. A: Yes. I love kids. I love the human mind. I think it is a most noble profession. Q: I think you’d be an excellent teacher, Santa. A: Oh, like everyone else, I have my pastimes. I cook, I like to build things. I love sports. Q: I hear a lot of folks from Chicago added something to their Christmas list this year. A: Yes, those poor Cubs fans. Q: You seem to talk about the Cubs every year. Are you a Cubs fan? A: Well, sure, everyone loves the Cubbies. You can’t help but love them. Just like you can’t help but love the Red Sox, the Browns, the Cavaliers or the Jets. Q: Are you calling all those teams losers? A: No, I’m calling them lovable. Q: Are the Yankees lovable? Q: I see. Do you go to the movies much? A: No, not so much any more. Q: Why not? Do you not like the movies? A: Not like I used to. I just can’t trust them. Even if they are telling a fictional story you can’t trust moviemakers to tell the story without unnecessary violence or other elements that tear down the human spirit. A: Mrs. Claus and I listen to a great deal of music. We believe music is nutrition for the spirit. You need it just like you need fruits and vegetables and sugar cookies. Q: Oh, that leads to the inevitable question. Santa. What about your weight? When are you going to lose some weight? A: What is with this obsession? Every adult I know asks me about my weight. But rarely does a kid ever ask me that. Why do you think that is? Q: I think you’re ducking the question, Santa. A: No, I’ll answer it. I think my weight is fine. I feel great, I look terrific. If it ain’t broke, don’t fix it. Q: Many live in fear that you’ll drop dead of a stroke or have a heart attack. A: And I could get hit by a bus, too. Look, I’ve been around longer than anyone else I know. My longevity is unmatched. Mrs. Claus keeps tabs on my health and if I’m out of line somewhere I am certain she’ll fix me up. Q: So what does Mrs. Claus say to you about your health? A: She says to eat up. Q: We know precious little about Mrs. Claus. What exactly is her job? A: Her job is to keep Santa being Santa. She helps me in so many ways. She not only helps me with my health and nutrition but she has an exceptional mind. When I run into a tough situation, Mrs. Claus is a voice of reason. I have no more valued advisor than her. She is my best friend, as any spouse should be to the other. Q: What kind of situations does Mrs. Claus have influence over? A: Well, think back to Christmas 2001, after the terrorist attacks in New York City. We had a lot of kids who lost parents or siblings or friends on September 11th. It takes a lot of wisdom to help a kid in a situation like that. I could not have done so without Mrs. Claus. Q: Wow, I had no idea. A: Yes, people tend to think of me in terms of what the see in a mall santa. That I just crank through the kids in a line, like changing oil or flipping pancakes. But it is not that way at all. Being Santa is a thinking man’s job. All kids have needs and most of the time the need is not toys or treats. Q: Can you really solve kids problems in one night a year? A: No, and that is a good point. Santa Claus gets a lot of press every December 24th. And that is fun, it is something I enjoy. But there are 364 other days of the year. And I work just as hard then and do things even more important on those days. Q: Really? What do you do the other 364 days of the year? A: I work with parents and together we try to direct kids to do good. Q: So, you dress up in your Santa suit and visit kids all year? A: Not exactly. Some days I do that. But mostly I work with lots of elves and together we go one-on-one with kids to help them out. Q: Really? Wow, I think I would have liked a visit from an elf when I was a kid. A: Sure but we work anonymously the rest of the year. The best way to help a kid, to be a friend, isn’t to bring him toys necessarily. It is to help him and be his friend when he doesn’t know or expect it. I put on my red suit and the whole world expects ho-ho-ho. And that has its time, don’t get me wrong. But helping kids the most is when you can help them when they don’t realize who you are or what you do — that you’re just interested in them. Q: Wait, wait, wait…are you saying that you work with kids everyday and that they don’t know it is you? A: Yes. That’s right. The elves too. Millions of them get out there everyday. In schools, at churches, in scouting, sporting events, all the places where kids go — there are elves everywhere. Helping. Doing. Being friends. That is the way it is. They never know the connection between Santa and Christmas. Q: Wow. Santa, did I have elves around me ever when I was a kid? A: It is the truth. You were never aware of it and that is the way it is suppose to work. Q: Well, Santa, can’t kids figure this out just based on what you’re telling us? A: Nope. The elves take an oath to never reveal their status. Q: I understand that. But kids today are pretty smart. Take your average seven year old. How many people are they going to know and interact with on a daily basis? Ten or twenty, maybe? A: Sure, kids should be suspicious that the people around them could be an elf. Or it could be me they are working with and they don’t even know it. 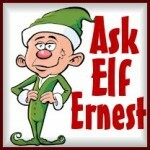 Q: How could a kid know if a person they are dealing with is an elf? A: They will never know. None have ever figured it out. But all kids have at least one elf in their lives and many have several. A: Yep, a school teacher can be an elf. Maybe a coach is an elf. Could be that even your parents or older siblings even are elves. Heck, your dog or your cat could be an elf. Q: Holy cow, Santa. This is blowing me away. You’re telling me that kids of the world are surrounded by elves that work in your service and they don’t even know it. Q: Well, no wonder Santa knows when you are sleeping and knows when you have been bad or good. It makes total sense to me now! A: It is no secret, really. We’re only trying to help in our own way. Q: Santa, thank you. This has been a most interesting interview after all. A: Thank you, Molly. And Merry Christmas. Q: Yes, indeed. Merry Christmas. That’s the message! A: That a girl, Molly. How does Santa eat all those cookies in one night?